Rhode Island KIDS COUNT: The 2019 Factbook is now available! Rhode Island KIDS COUNT released its twenty-fifth annual report on the well-being of Rhode Island's children. NLIHC: Advocates’ Guide 2019 Now Available! 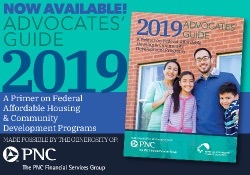 NLIHC’s annual publicationAdvocates’ Guide 2019: A Primer on Federal Affordable Housing & Community Development Programs, a comprehensive resource about virtually every affordable housing program and policy, is now available! On April 4, 2019, HUD published a proposed regulation to implement the policies of Section 3 of the Housing and Urban Development Act of 1968, as amended (“Section 3”). A Conversation on Housing Policy with Mayor of Providence, Jorge Elorza.